Located just metres from Eastbourne seafront, the Hydro Hotel features 81 bedrooms, welcoming staff, two restaurants, an outdoor pool and garden, free on-site parking, five fully-equipped meeting rooms and Wi-Fi access available throughout. Eastbourne's elegant seafront is a joy to behold and overlooking the aptly named Grand Parade, is the Mansion Lions Hotel. The New Wilmington Hotel is a charming, friendly, family run hotel with over 30 years experience in the business. 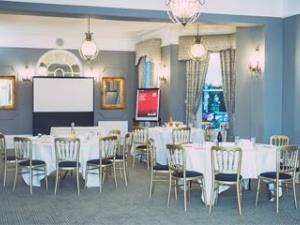 Close to the seafront, theatres and conference venues. The Culinary Art Studio at the University of Brighton is located in the picturesque village of Meads. It combines a state-of-the-art, fully equipped commercial kitchen with a demonstration restaurant, private dining and conference facility. The University of Brighton's campus in Eastbourne has facilities available to hire during evenings, weekends and vacation periods. The site is perfectly located in the peaceful "Meads" area of town.